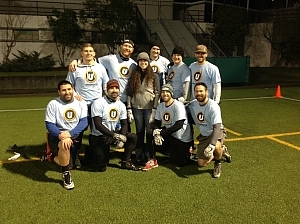 It was another championship season for the Lawn Wranglers as they turned it on for the playoffs. In the championship game it was a Precision performance as the lawn Rangers scored on every single possession, and made most of their two pointers as they eclipsed the Denver Donuts 50-40. Josh Sauve led the way with two long touchdown grabs and a key interception has the Lawn Wranglers racked up yet another championship. Another Trophy For The Moose! It was a test of Wills strength and endurance as Puget Sound Moose edged out Black and Yellow for the mid core championship. After cruising through in the semi-finals, a devastating injury at the end of their victory left the championship game with a big question mark. 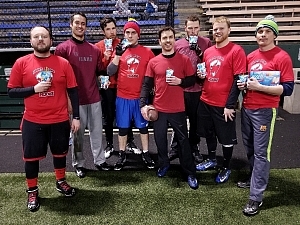 But quarterback Dan Quirk led the way with a steady hand and quick feet, and PSM managed to squeak by their opponents by a final score of 32 to 26. The game came down to the final play but in the end, they got the stop in the Moose climb the mountain once again.